World Vision integrates biofortified nutritious crops into comprehensive food and nutrition security efforts in countries with high burdens of hunger and malnutrition, in partnership with HarvestPlus. Together, World Vision and HarvestPlus work to improve nutrition for hundreds of millions of people around the world who suffer from hidden hunger. Learn more about Harvest Plus' work in biofortification! On September 20, 2017 they were named one of four finalists in the prestigious global 100 & Change competition put on by the MacArthur Foundation. We wish them all the best in the competition! World Vision has expanded the reach of biofortified crops from 4 countries in 2012 to 17 countries in 2016: Ghana, Kenya, Mozambique, South Sudan, Tanzania, Uganda (vitamin A sweet potato); Burundi, DRC, Kenya, Lesotho, Rwanda, Tanzania, Uganda, Zimbabwe (iron beans); Afghanistan, Pakistan (zinc wheat); India (iron pearl millet); Bangladesh (zinc rice); Zambia, Zimbabwe (vitamin A maize); and Bolivia (iron and zinc potatoes, with International Potato Centre). A number of other countries are exploring the options of biofortification in their context. Learn more about Harriet and Martin, from Uganda. Their son Emmanuel was malnourished, but now he and his younger brother, Oscar, are healthy and thriving. Hidden hunger is caused by a chronic lack of critical vitamins and minerals that puts children and adults at increased risk of stunting, anaemia, blindness, infectious diseases and even death. One in three people globally suffer from hidden hunger and women and children are especially vulnerable. The partnership focuses on improving access to nutritious staple food crops— for home consumption and to sell in local markets—for vulnerable farming communities. In Uganda - here and here. World Vision's work with HarvestPlus in northern Uganda was also featured in Roger Thurow's book, The First 1,000 Days: A Crucial Time for Mothers and Children—And the World. Check out the Chicago Council's web interactive feature that introduces us to families such as Esther, Tonny, and their son Rodgers; Brenda and her son Aron; and Harriet, Moses and their daughter Apio, whose twin sister did not survive. In June 2016, World Vision presented at an IFPRI special event: Going the Last Mile: Accelerating Progress in Food Security and Nutrition. You can access the presentation: Biofortification as part of multi-dimensional nutrition programmes in Uganda, Burundi and Bangladesh. In 2014, World Vision participated in the 2nd Global Conference on Biofortification Getting Nutritious Foods to People in Kigali, Rwanda, and two colleagues were interviewed for the Conference Impressions video (3:53 and 5:56). Conference proceedings can be accessed here. 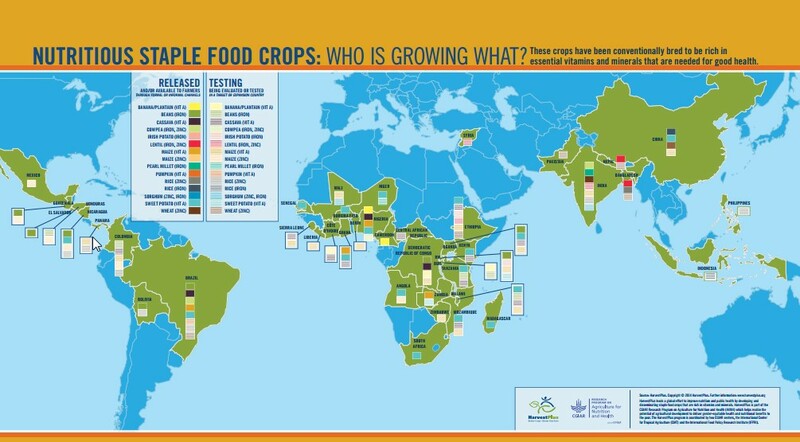 Check out HarvestPlus' Infographic "Nutritious Staple Food Crops: Who is Growing What?" that shows just how far nutritious staple food crops have spread in only a few years. It includes countries where governments have released new varieties of nutrient-rich crops and those where new crops are bring field tested and evaluated for eventual release. Many of these food staples are nutritious in their own right but now have an added dose of vitamins or minerals. When you throw in high yield, combined with pest resistance or climate-smart traits, it's easy to see why more than one million farmers around the world are already growing these crops.